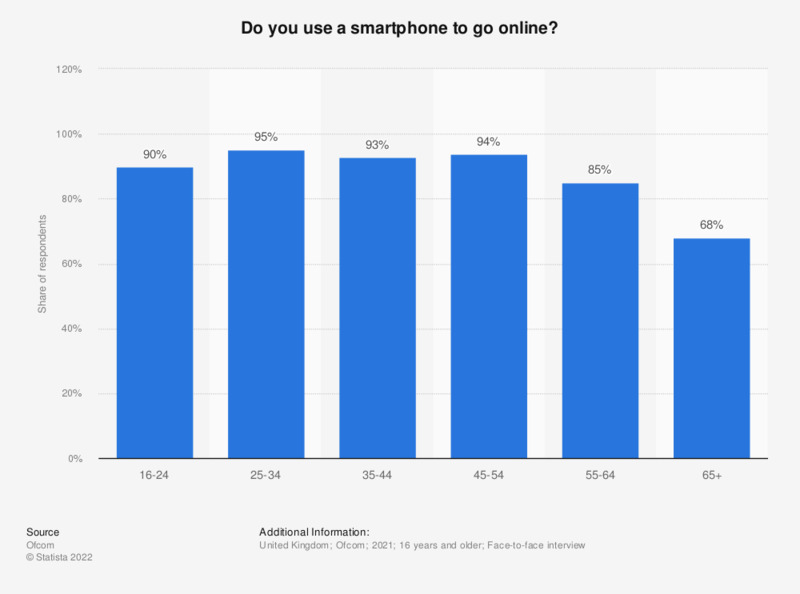 This statistic displays the findings of a survey on the use of smartphones to go online in the United Kingdom (UK) in 2017, by age group. In 2017, use of smartphone to browse the internet was higher among younger surveyed age groups. Of responding internet users, 95 percent of respondents aged 16 to 24 reported using their smartphones to access the internet. According to a study conducted by Ofcom in 2015, 97 percent of respondents among the 16 to 24 age group, stated that they had used such devices to go online. "Do you go online using any of these devices? Please bear in mind that certain apps that you may use on a mobile phone or tablet computer may require you to go online; for example, social media, news or online video apps such as YouTube."